BC Ferries operates scheduled daily sailings on the Sunshine Coast from Earls Cove on the Sechelt Peninsula across Jervis Inlet to Saltery Bay on the Malaspina Peninsula. Horseshoe Bay/Langdale and Earls Cove/Saltery Bay ferry schedules are not guaranteed to connect, so please plan your travels accordingly. To reach Earls Cove Ferry Terminal, and the Sunshine Coast, drive north from Vancouver to Horseshoe Bay and take the ferry to Langdale on the Sechelt Peninsula. 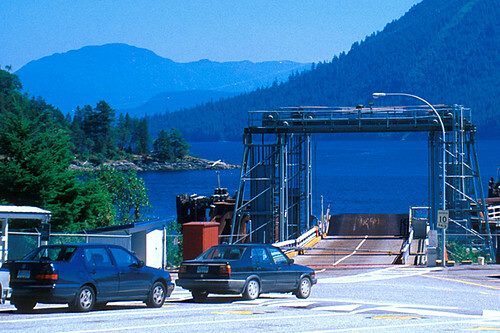 The road distance between the Langdale Ferry Terminal and Earls Cove Ferry Terminal is 84 km (52 miles), approximately 90 minutes driving time along the scenic Sunshine Coast. From Earls Cove, the ferry crosses Jervis Inlet to reach Saltery Bay and the Upper Sunshine Coast (Malaspina Peninsula). The distance between Powell River and Saltery Bay is 34 km (22 miles). Circle Tour: See the best of the area on a driving Circle Tour. Head north out of Vancouver for the scenic Sunshine Coast and Vancouver Island Circle Tour. Board a B.C. Ferries vessel at Powell River that will take you across the waters of the Strait of Georgia to Comox, on Vancouver Island’s east coast. Travel south to Victoria and return to Vancouver by ferry from Swartz Bay to Tsawwassen. Circle Tours in British Columbia.